At the law offices of Carmel W. Sanders, Attorney at Law, in Macon, Georgia, family law clients find knowledgeable, dedicated legal counsel and representation. Attorney Sanders has extensive experience in litigation over the last 30 years. 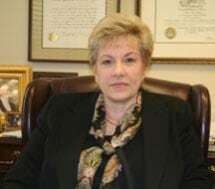 She has been a Georgia attorney since 1983 and has been admitted to practice in all Georgia courts, including the Supreme Court of Georgia and the Court of Appeals of Georgia. She is also admitted to practice before the Supreme Court of the United States. She has been active in the State Bar of Georgia (Family Law Section) and in William Augustus Bootle American Inn of Court. As a solutions-oriented lawyer, Ms. Sanders guides Georgians adeptly and compassionately through the necessary steps of family law issues including divorce, child custody, child support, property division, alimony, enforcement, modification, stepparent adoptions and international adoptions. Many divorces can be resolved through peaceful means such as mediation. Others require aggressive litigation. Ms. Sanders is skilled at all methods of divorce and child custody dispute resolution. It is often the case that one party in a divorce will seek to be represented by her, only to discover that the other has already retained her. This is just one illustration among many of the strong reputation the law firm enjoys in the area of family law in and around Macon. In addition to handling an array of family law cases, Ms. Sanders represents clients in personal injury matters. Carmel W. Sanders, Attorney at Law, also offers counsel and referrals for potential clients with other legal needs.